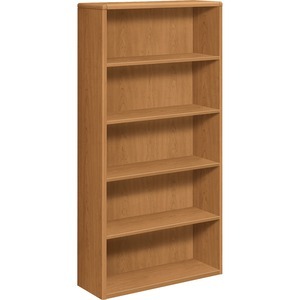 Sturdy, five-shelf bookcase features a lustrous, Harvest laminate finish and double-radius edges to match other HON 10700 Series Laminate Wood Furniture components. It is ideal for storing and displaying books, photos, certificates and more. Finished back provides a clean, professional appearance and allows placement anywhere, not just against a wall. Finished back, top surfaces and end panels are made with durable, premium, high-pressure laminate to resist stains and scratches. Five strong, durable shelves support heavy loads. Shelf count includes bottom shelf. Each shelf is fixed and holds up to 78 lb. Bookcase meets or exceeds ANSI/BIFMA standards and is SCS Certified as complying with specific, indoor air-quality requirements.